This wonderful deal is exactly as it’s sounds. Buy any 5 McCafe beverages and you get 1 free! You must use the McDonald’s App to redeem your free McCafe beverage. You’re only able to redeem this deal once and it’s only available at participating locations. This deal expires at the end of the month. Another absolutely solid McDonald’s special! Again, this must be redeemed using their mobile app and it’s only available at participating locations. Better hurry quick – this one expires at the end of March. Simply purchase a Medium or Large Fries and you’ll be able to get a free soft drink of any size! I’ll save the best deal for last! I can’t think of many things better than a $0.25 Big Mac of Filet-O-Fish! This special promo deal is only available until the 31st of the month and isn’t available at every location. But the good news is that you can use it once a week! Keeping in line with the other McDonald’s deals this week, this only is available for redemption through the McDonald’s mobile app. Simply buy one Filet-O-Fish or Big Mac and you can get another one for only a quarter. Absolutely awesome deal that you should definitely take advantage of while it lasts. New menu items at McDonald’s are always a blast! This month there are seven new major menu items and there is sure to be a new favorite for everyone. Among these seven new menu items we have two very distinct themes – Bacon and Mushrooms. 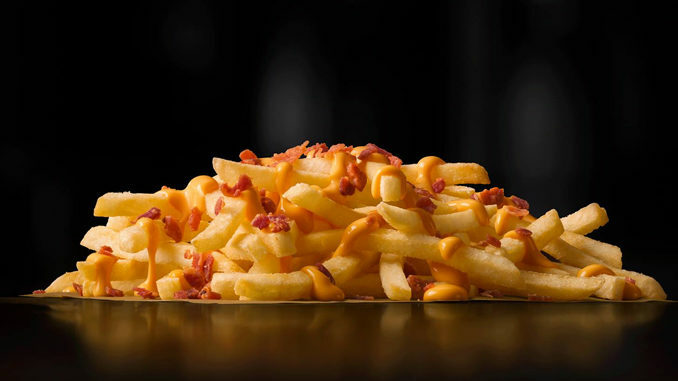 McDonald’s takes 3 very popular classic menu items and adds bacon to the mix. Among these choices are The Big Mac Bacon, Cheesy Bacon Fries, and the Quarter Pounder with Cheese Bacon. For their new Mushroom burger offerings they have the Mushroom & Swiss Burger, Double Mushroom & Swiss Burger, Mushroom & Swiss Buttermilk Crispy Chicken, and the Mushroom & Swiss Artisan Grilled Chicken. So many new premium menu items to try out this month, let us know which one is your favorite!